Mike Ullery | Miami Valley Today Troy Medic 3 responds to a call in Westbrook during Saturday’s snow storm. Law enforcement, fire, and EMS units continued to patrol and respond to calls for assistance throughout the winter storm. 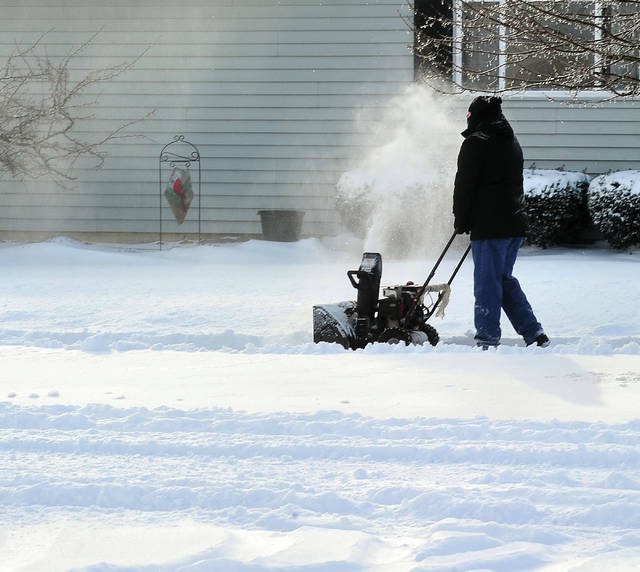 Mike Ullery | Miami Valley Today Sunday morning found Troy residents beginning to dig out from the area’s most recent snow storm. Mike Ullery | Miami Valley Today Snow plows and snow shovels are hard at work digging out from the latest snowstorm. Mike Ullery | Miami Valley Today Blue sky to the west signals the end of the latest round of weather to hit a snow-covered Miami County. Cody Willoughby | Miami Valley Today Troy resident Ellie Snyder clears her car windshield on Sunday, following the effects of Winter Storm Harper. Cody Willoughby | Miami Valley Today Troy property owner Scott Oda shovels a walkway on Sunday, following snowfall brought on by Winter Storm Harper. Cody Willoughby | Miami Valley Today Maintenance worker Mike “Frog” Laughman clears the sidewalks outside Troy-Miami County Public Library on Sunday, following heavy snowfall brought on by Winter Storm Harper. Mike Ullery | Miami Valley Today Piqua City Schools employees clear sidwalks at Piqua High School on Sunday afternon. 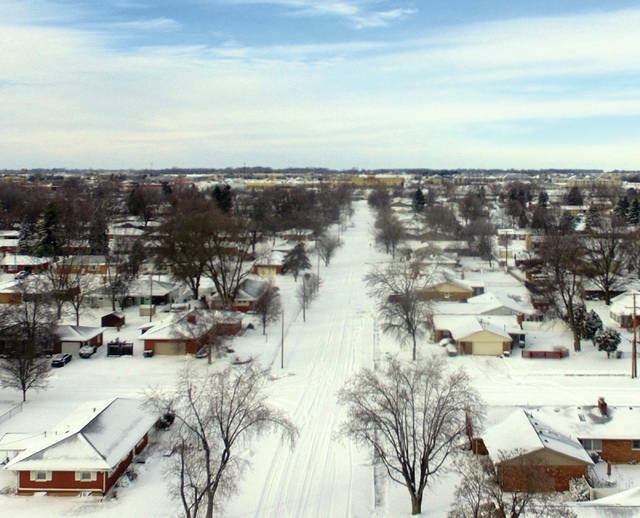 MIAMI COUNTY — Winter Storm Harper moved through the area on Saturday, bringing a barrage of snow, sleet and ice that left many residents without electricity, made roads perilous, and forced delays, closings and cancellations for churches, businesses, and various activities. A number of road slide-offs occurred due to the blizzard-like conditions, but only one serious injury was reported following an ATV accident in Piqua. In addition, Miami County was on a Level 1 snow emergency on Saturday evening and was taken off emergency status early Sunday morning. As of 11:30 a.m. Sunday, Dayton Power & Light Company’s outage map showed 200 Miami County consumers were still without power — down from 850 an hour earlier — and Pioneer Electric Cooperative had about 935 consumers still affected by the outage, according to Nanci McMaken, vice president and chief communication officer for Pioneer. McMaken said that Pioneer crews were assisted by contractor crews, and at the peak of Saturday’s outages, an estimated 4,000 consumers were out of service. “Our crews have been hard at it this morning on remaining outages and the ones that occurred this morning, and we anticipate having everyone back in service today,” she said on Sunday. Mary Ann Kabel, communications director for Dayton Power & Light, said crews worked overnight, with assistance from other area crews, working as quickly and safely as possible to address all reported outages. “When Winter Storm Harper came through, in total, it impacted 31,000 customers — thankfully, not all at once. Our peak outage was about 13,000 around 11 p.m. Saturday,” Kabel said. By noonSunday, the outage number was 1,300 customers in all of DP&L’s service areas. “I think that’s absolutely remarkable, in light of the storm and conditions,” Kabel said, adding that of those 1,300, just under 300 were Miami County customers. DP&L has 30,024 customers in Miami County. Pioneer and DP&L had all their customers up and running as of Sunday night, both McMaken and Kabel reported. Kabel noted that DP&L has several measures in place to prepare for hazardous weather, including monitoring the forecasts well in advance and making sure all crews and support staff are ready for action. The company also sends out emails addressing storm preparedness and how to assemble readiness kits to customers and media outlets, as well as posting information and updates on social media. Kabel also emphasized the importance of customers with special medical needs — such as those dependent on electricity powered oxygen concentrators — having a back-up plan. “I also would encourage them to call their utility companies and have them note that they have needs like oxygen,” she said. Miami County Sheriff’s Office Lt. Mike Whaley said deputies responded to 16 assist motorist calls in 24 hours, but there were no serious accidents related to the weekend storm. 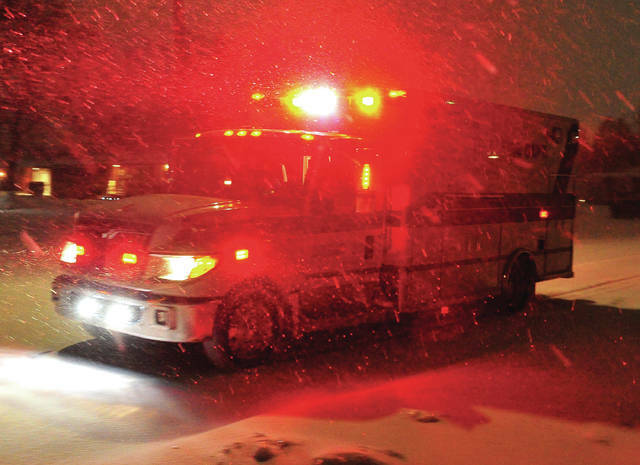 There was one weather-related accident in Piqua reported during the time of the winter storm. Lt. Marcos Rodriguez of the Piqua Police Department said a snow plow bumped into a parked car at approximately 4 a.m. Sunday morning on the 700 block of Young Street. Later Sunday, an ATV accident involving a sled resulted in a pre-teen being transported by CareFlight to a hospital after sustaining serious but not life-threatening injuries. Assistant Chief Jon Stevens of the Piqua Fire Department said that an ATV was pulling a sled behind it when it struck another vehicle on County Road 25-A near Snodgrass Road. The accident was reported at approximately 4:50 p.m. Stevens said that those involved in the accident were out in a field when it happened. The Piqua Fire Department then transported the 12-year-old male patient to their CareFlight landing zone behind the American Legion on Water Street, after which CareFlight transported boy to Children’s Medical Center. The Piqua Fire Department was unable to release specific information about the patient’s injuries, but it was noted that they were not life-threatening. Wintry weather also shut down evening activities at schools and churches, and caused districts including Miami East, Newton, Troy and Piqua City Schools, and the Upper Valley Career Center to cancel classes on Tuesday. The Piqua YWCA also canceled its annual Martin Luther King Jr. Day event on Monday — the first time in 11 years, according to YWCA Community Relations Director Gretchen Roeth. The Miami County Park District closed its parks on Saturday and Sunday due to the inclement weather. “We look at road conditions and whether our staff can safely get from park to park, especially since so many of our parks are rural,” said Executive Director Scott Myers. On Monday, city of Troy Director of Public Service and Safety Patrick Titterington said, “We have used approximately 120 tons (of salt) and counting. We are not salting secondary and locals because the salt will not work in these sub-freezing temperatures. We had 20 guys out Saturday night all night through Sunday morning and there are two guys salting the main roads (Monday afternoon). West Milton Service Director Ben Herron said that crews were out night and day this weekend and that all roads in the village have been plowed and salted. He noted that high winds have caused issues with drifting snow. Herron said that West Milton road crews stagger their start times and follow predetermined plow routes. The village also has reserve drivers, including Herron, to provide breaks for other drivers. West Milton has also been affected by scattered power outages, he added. “Our main water pump station that fills our water towers is operating on backup generators,” Herron said Sunday. The winter storm struck hard across the state, sending more than 1,300 crews from the Ohio Department of Transportation out with snow plows, according to ODOT Press Secretary Matt Bruning’s Twitter page. Tuesday’s forecast calls for a high near 35, with wind chill values as low as -4 degrees. Chance of rain is 100 percent, mainly after 8 p.m.
https://www.dailycall.com/wp-content/uploads/sites/30/2019/01/web1_011919mju_weather_medic-12.jpgMike Ullery | Miami Valley Today Troy Medic 3 responds to a call in Westbrook during Saturday’s snow storm. Law enforcement, fire, and EMS units continued to patrol and respond to calls for assistance throughout the winter storm. https://www.dailycall.com/wp-content/uploads/sites/30/2019/01/web1_012019mju_weatgjer1-12.jpgMike Ullery | Miami Valley Today Sunday morning found Troy residents beginning to dig out from the area’s most recent snow storm. 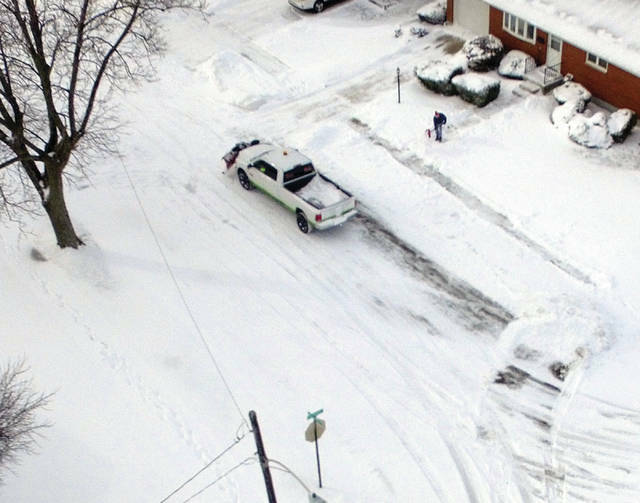 https://www.dailycall.com/wp-content/uploads/sites/30/2019/01/web1_012019mju_weather2-12.jpgMike Ullery | Miami Valley Today Snow plows and snow shovels are hard at work digging out from the latest snowstorm. https://www.dailycall.com/wp-content/uploads/sites/30/2019/01/web1_012019mju_weather3-12.jpgMike Ullery | Miami Valley Today Blue sky to the west signals the end of the latest round of weather to hit a snow-covered Miami County. 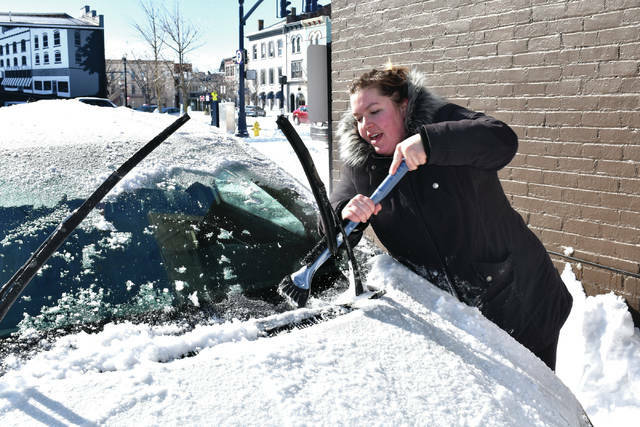 https://www.dailycall.com/wp-content/uploads/sites/30/2019/01/web1_Snowstorm2-3.jpgCody Willoughby | Miami Valley Today Troy resident Ellie Snyder clears her car windshield on Sunday, following the effects of Winter Storm Harper. 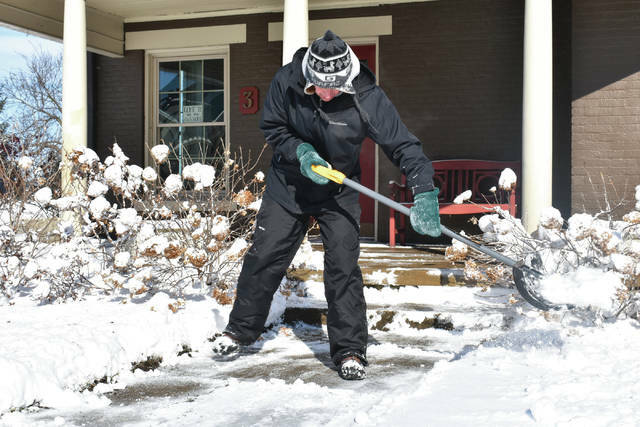 https://www.dailycall.com/wp-content/uploads/sites/30/2019/01/web1_Snowstorm3-3.jpgCody Willoughby | Miami Valley Today Troy property owner Scott Oda shovels a walkway on Sunday, following snowfall brought on by Winter Storm Harper. 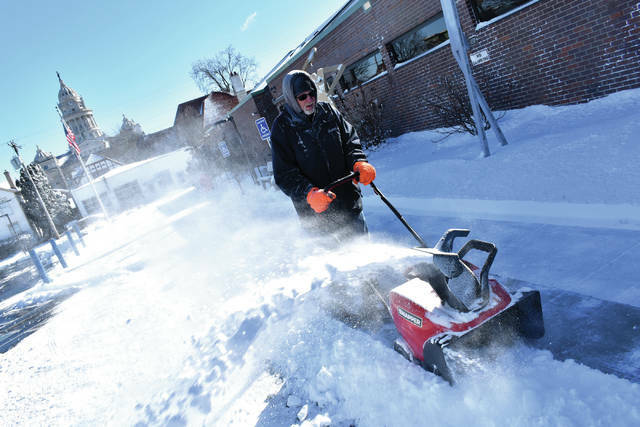 https://www.dailycall.com/wp-content/uploads/sites/30/2019/01/web1_Snowstorm1-3.jpgCody Willoughby | Miami Valley Today Maintenance worker Mike “Frog” Laughman clears the sidewalks outside Troy-Miami County Public Library on Sunday, following heavy snowfall brought on by Winter Storm Harper. 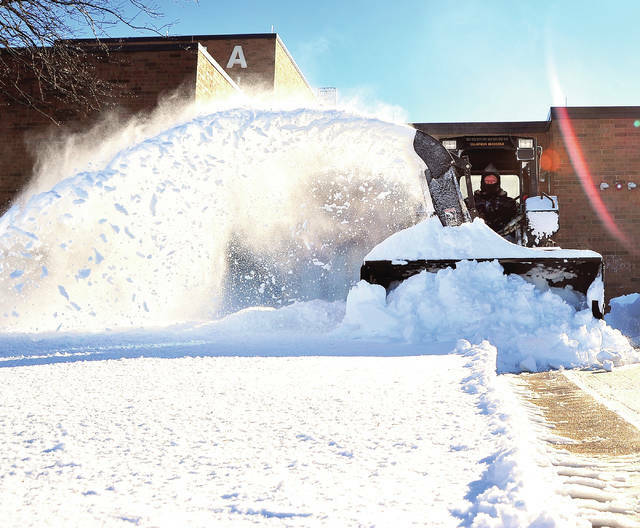 https://www.dailycall.com/wp-content/uploads/sites/30/2019/01/web1_012019mju_weather5-2.jpgMike Ullery | Miami Valley Today Piqua City Schools employees clear sidwalks at Piqua High School on Sunday afternon. Belinda M. Paschal, Cecilia Fox, Melanie Yingst and Sam Wildow contributed to this story.